Dr. Esquivel received an award from the PMP Pals' Network for his outstanding contribution to finding a cure for the treatment of Peritoneal Surface Malignancies and Peritoneal Carcinomatosis. The award was presented to Dr. Esquivel, by Pals' Network founder, Gabriella, during the 15 Year Anniversary Celebration of the PMP Pals' Network, October 2013. Internationally known for instructing other surgical oncologists in the treatment of PSMs and GI/Colorectal cancers and has played a vital role in the development of HIPEC treatment programs in Mexico, with future programs underway in additional countries. Dr. Esquivel was at the forefront of creating the HIPEC Consensus in 2006 as well as the expanded HIPEC Consensus for 2013. Dr Esquivel is the President of the American Society of Peritoneal Surface Malignancies (ASPSM) comprised of nearly 200 healthcare providers in 20 countries. Most recently he has developed the international STAT Consult Program enabling physicians to resolve challenging cancer cases in real time. Drs Jesus Esquivel and Paul Sugarbaker demonstrate surgery techniques on patients diagnosed with Pseudomyxoma Peritonei. Drs Esquivel and Basave-Lopez demonstrate specialized surgical techniques. Surgical oncologists, treating rare and often aggressive cases of PSMs, Peritoneal Carcinomatosis, and a variety of GI and Colorectal cancers, may face situations outside the realm of “conventional” cancer cases. While considering appropriate and effective treatment(s) of some of these more challenging medical cases, surgical oncologists sought a method of sharing patient case histories and exchanging treatment methodology, among their professional colleagues, in a real time environment. Dr. Jesus Esquivel recently developed an online “STAT Consult Program” enabling fellow physicians to present rare cancer cases, while receiving “real time” suggestions from their colleagues. Dr. Esquivel: “I treated him with CRS and HIPEC on June 10. Last week’s scan revealed no disease. GG: Are STAT Consult Program requests distributed via email, videoconference, Face Time (iPhone/iPad) or SKYPE? Dr. Esquivel: “At the present time, the fastest and most efficient method we utilize for distributing STAT Consult Program requests is via private email. Additionally, Dr. Kiran Turaga is developing a web based consultation program to complement our email STAT program. GG: Are surgeons who participate in the STAT Consult Program members of the ASPSM? GG: “How often do the participating surgeons share cases through the STAT Consult Program? Weekly, monthly or as needed? Dr. Esquivel adds” Thanks to current technology, the world has become a neighborhood. Articles posted in PMP Pals and on www.pmppals.org are written from the perspective of patients and their family caregivers and are not intended to substitute for licensed, professional medical care. Patients should seek the council of their licensed healthcare providers. Copyright © 2013 by PMP Pals’ Network Publishing/All rights reserved. Todos derechos reservados. We have HOPE for YOU! Jesus Esquivel, M.D. Inducted Into Mexican Academy of Surgery. 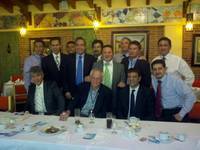 Colleagues of Dr. Jesus Esquivel are proud to announce his induction into the prestigious Mexican Academy of Surgery. 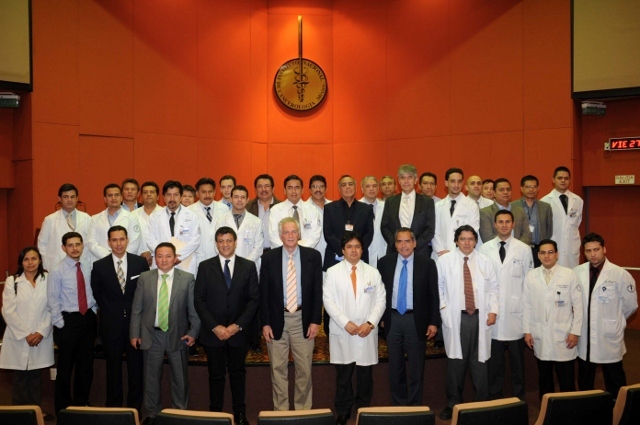 Dr. Esquivel’s is one of only 400 doctors world-wide to be invited to take part in the academy’s membership structure, which unifies physicians who have made significant scientific contributions to the practice of surgery, and who remain committed to humanitarian efforts to improve the quality of medical and patient care offerings in Mexico. 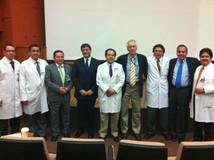 Dr. Esquivel's nomination and induction into the academy results from his ongoing efforts to educate and mentor physicians in Mexico on how to effectively perform abdominal cancer surgeries. Dr. Esquivel obtained his medical degree from the Universidad Autonoma de Tamaulipas in Mexico, before relocating to the United States to complete a surgical internship at Washington Hospital Center and a general surgery residency at The New York Hospital of Queens, where he later became Chief Surgical Resident. Before joining Saint Agnes Hospital’s medical staff in 2004, he worked as an attending, general and oncology surgeon for Kaiser Permanente in Washington D.C., serving as the national referral for all patients in the U.S. with peritoneal surface malignancies. Dr. Esquivel currently serves as President of the American Society for Peritoneal Surface Malignancies. Additionally, he is an assistant professor of gynecologic oncology at Johns Hopkins School of Medicine, and an adjunct member for the U.S. Military Cancer Institute. >Cytoreductive surgery and hyperthermic intraperitoneal chemotherapy in the treatment of peritoneal carcinomatosis: initial experience in Oaxaca, Mexico. Authors :García-Matus R, Hernández-Hernández CA, Leyva-García O, Vásquez-Ciriaco S, Flores-Ayala G, Navarro-Hernández Q, Pérez-Bustamante G, Valencia-Mijares NM, Esquivel J. Source:Hospital Regional de Alta Especialidad de Oaxaca, Oaxaca, México. Article written by Dr. Jesus Esquivel. Copyright © 2012 by Dr. Jesus Esquivel and the PMP Pals’ Network. All rights reserved. intraperitoneal chemotherapy. In Proceedings of the 3rd International Congress on Neo-Adjuvant Chemotherapy. Banzed P, Holland JF, Khayat D, Weil M, editors. New York, Springer-Verlag, 1991, 239-242. 2. Vidal-Jove J, Pessagno AM, Esquivel J, Buck D, Steves MA, Sugarbaker PH: Technical aspect and morbidity assessment of intraperitoneal chemotherapy administered by repeat paracentesis. Reg Cancer Treat 4. 294-297, 1992. 3. Esquivel J, Vidal-Jove J, Steves MA, Sugarbaker PH: Morbidity and mortality of cytoreductive surgery and intraperitoneal chemotherapy. Surgery. 1993 Jun; 113(6):631-6. 5. Sugarbaker PH, Esquivel J, Gomez A, Berthet B: Clinical research methodologies in diagnosis and staging of patients with peritoneal surface malignancy. (In) Bismuth H, Galmiche JP, Huguier M, Jaeck D (eds); 8th World Congress of the International Gastro-Surgical Club. Monduzzi Editore. Bologna pp 887-891, 1998. 6. Esquivel J, Sugarbaker PH: Elective surgery in recurrent colon cancer with peritoneal seeding: When to proceed and when not to. Cancer Therapeutics 1: 321-325, 1998. 7. Esquivel J, Krishnan J, Jundi M, Sugarbaker PH: Rosai-Dorfman Disease (Sinus Histiocytosis with Massive Lymphadenophathy) of the pancreas: First case report. Hepato-Gastroenterology 46: 1202-5, 1999. 9. Stephens AD, White SK, Belliveau JF, Bland RK, Esquivel J, Joyner JJ, Steves MA, Stuart AO and Sugarbaker PH: Hyperthermic Intraoperative Intraperitoneal Chemotherapy: A Multidisciplinary Manual for Perioperative Staff. October, 1998. 10. Stephens AD, Sugarbaker PH, Alderman R, Chang D, Esquivel J, Steves MA: Morbidity and mortality of 200 treatments with cytoreductive surgery and hyperthermic intraoperative intraperitoneal chemotherapy using the coliseum technique. Ann Surg Onc 6(8): 790-796, 1999. 11. Esquivel J, Angulo F, Bland KB, Stephens AD and Sugarbaker PH: Hemodynamic and Cardiac Function Parameters during Heated Intraoperative Intraperitoneal Chemotherapy. Ann Surg Onc 7(4): 296-300, 2000. 12. Pestieau SR, Esquivel J and Sugarbaker PH: Pleural extension of Mucinous Tumor in patients with Pseudomyxoma Peritonei Syndrome. Ann Surg Onc 7(3): 199-203, 2000. 13. Esquivel J and Sugarbaker PH: Pseudomyxoma Peritonei in a hernia sac: Analysis of 20 patients in whom mucoid fluid was found during a hernia repair. Eur J Surg Onc 27(1): 54-58,2001. 14. Esquivel J and Sugarbaker PH: Clinical Presentation of The Pseudomyxoma Peritonei Syndrome. Br J Surg 87:1414-1418, 2000. 15. Maurette R, Esquivel J, Mihura M and Sugarbaker PH: Manejo de la Carcinomatosis Peritoneal: Rol del Cirujano. Rev Argentina Cirug. 79:123-137; 2000. 16. 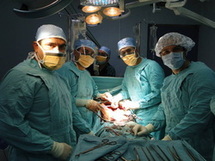 Esquivel J and Sugarbaker PH: Second-look surgery in patients with peritoneal dissemination of appendiceal malignancy. Analysis of Prognostic Factors in 98 patients. Ann Surg 234(2):198-205,2001. 17. Brackman MR, Foley E, Esquivel J, Boisvert ME, Davis SK et al. : Bare bones laparoscopy: A randomized prospective trial of cost savings in laparoscopic cholecystectomy. J Laparoendosc Adv Surg Tech A. 12 (6): 411-7, Dec 2002. 18. Carmignani CP, Esquivel J, Sugarbaker PH: Cytoreductive surgery and intraperitoneal chemotherapy in the treatment of peritoneal surface malignancy. Rev Oncol 5(4):192-198, 2003. 19. Jundi M, Lack EE, Brun EA, Esquivel J, Kumar D: Glomus Tumor of the duodenum: a case report. Int J Surg Pathol. 12(4): 411-414, 2004. 20. Fripp VT, Esquivel J and Cerruto AC: Perianal Melanoma Disguised as Hemorrhoids: Case Report and Discussion. J Natl Medical Assoc. 97, No 5,726-731, May 2005. 22. Sugarbaker PH, Alderman R, Edwards G, Marquardt CE, Gushchin V, Esquivel J, Chang D: Prospective morbidity and mortality assessment of cytoreductive surgery plus perioperative intraperitoneal chemotherapy to treat peritoneal dissemination of appendiceal mucinous malignancy. Ann Surg Oncol. 2006 May;13(5):635-44. 23. Yan TD, Esquivel J, Carmignani P, Sugarbaker PH: Cytoreduction and intraperitoneal chemotherapy for the management of non-gynecologic peritoneal surface malignancy. J Exp Clin Cancer Res 22,4, 109-117, 2003. 24. Sugarbaker PH, Esquivel J, Eroglu A: Search for the critical difference in surgical technology for colorectal cancer resection. XXV Volume, International Meeting of Surgery. 25. Cabanas J, da Silva R, Zappa L, Esquivel J, Cerruto C, Goldstein P, Sugarbaker PH: Splenic metastases from mucinous neoplasms of the appendix and colon. Tumori. 92 (2):104-12, 2006. 26. Esquivel J, Davis SK, Manning D: Appendiceal cancer and peritoneal carcinomatosis: a report of 29 cases. Am Surg 72(8):714-7, 2006. 27. Esquivel J, Sticca R, Levine E, Sugarbaker PH, and The Peritoneal Surface Malignancy Group: Cytoreductive Surgery and Intraperitoneal Hyperthermic Chemotherapy in the Management of Peritoneal Surface Malignancies of Colonic Origin: A Consensus Statement. Ann Surg Oncol. 2007 Jan;14(1):128-33. 28. Kerscher A, Pitroff AN and Esquivel J: Morbidity and Mortality of 109 Consecutive Cytoreductive Surgeries with Intraperitoneal Hyperthermic Chemotherapy, World J Surg. 2010 Jan;34(1):62-9. 29. Esquivel J, Elias D, Baratti D, Kusamura S and Deraco M: Consensus Statement on the Loco Regional Treatment of Colorectal Cancer with Peritoneal Dissemination. Journal Surg Oncology; 98:263-267, 2008. 30. Esquivel J: Cytoreductive Surgery and Hyperthermic Intraperitoneal Chemotherapy in the management of Peritoneal Surface Malignancies of Colonic Origin. Applied Cancer Research; Vol 27, No 4, 2007. 31. Hamirani Y, Ndigwe E, Kompella S, Mannuel H, Shekitka K, Siebel J and Esquivel J: Epithelioid hemangioendothelioma of the peritoneum: A diagnostic challenge. Surgical Rounds. Vol 31, NO 3: 72-76, 2008. 32. Pelz O, Stojadinovic A, Nissan A, Hohenberger W and Esquivel J: Evaluation of a Peritoneal Surface Disease Severity Score in patients with Colon Cancer and Peritoneal Dissemination. J Surg Oncol; 99 (1): 9-15, 2009. 33. Kerscher A and Esquivel J: Current status and future directions: Management of colon cancer with peritoneal dissemination. Future Oncology. 4 (5), 671-679, 2008. 34. Esquivel J, Nissan A, Stojadinovic A: Cytoreductive Surgery and heated intraperitoneal chemotherapy in the treatment of peritoneal carcinomatosis of colorectal origin: The need for practice altering data. J Surg Oncol; 98 (6) 397-8, 2008. 36. Moradi B and Esquivel J: Learning Curve in Cytoreductive Surgery and Hyperthermic Intraperitoneal Chemotherapy. J Surg Oncol;100 (4): 293-296, 2009. 37. Esquivel J: Technology of HIPEC in the United States, Europe, China, Korea and Japan. Cancer Journal; 15 (3) 249-54, 2009. 38. Esquivel J and Averbach A: Combined Laparoscopic Cytoreductive Surgery and Hyperthermic Intraperitoneal Chemotherapy in a patient with peritoneal mesothelioma: First Case Report. J Laparoendosc Adv Surg Tech; 19 (4): 505-7, 2009. 39. Chua TC, Morris DL, Esquivel J: Impact of the Peritoneal Surface Disease Severity Score on Survival in Patients with Colorectal Cancer Peritoneal Carcinomatosis Undergoing Complete Cytoreduction and Hyperthermic Intraperitoneal Chemotherapy. Ann Surg Oncol. 2010 May;17(5):1330-6. 40. Esquivel J and Chua T: CT versus Intraoperative Peritoneal Cancer Index: The importance of the difference between Statistical Significance and Clinical Relevance. Ann Surg Oncol; 16 (9) 2662, 2009. 41. Nissan A, Stojadinovic A, Garofalo A, Esquivel J and Piso P: Evidence-based medicine in the treatment of peritoneal carcinomatosis: Past, present and future. J Surg Oncol; 100 (4): 335-344, 2009. 42. Piso P, Glockzin G, von Breitenbuch P, Sulaiman T, Popp F, Dahlke M, Esquivel J and Schlitt H: Patient Selection for a Curative Approach to Carcinomatosis. Cancer Journal; 15 (3) 236-42, 2009. 43. Esquivel J, Chua T, Stojadinovic A, Torres-Melero J, Levine E et al. : Accuracy and Clinical Relevance of Computed Tomography Scan Interpretation of Peritoneal Cancer Index in Colorectal Cancer Peritoneal Carcinomatosis: A Multi-Institutional Study, J Surg Oncol. 2010 Nov 1;102(6):565-70. 45. Stojadinovic A, Nissan A, Eberhardt J, Chua T, Pelz J and Esquivel J: Development of a Bayesian Belief Network Model for Personalized Prognostic Risk Asessment in Colon Carcinomatosis. Am Surg. 2011 Feb;77(2):221-30. 46. Gillern S, Chua T, Stojadinovic A and Esquivel J: K-RAS Status in Patients with Colorectal Cancer Peritoneal Carcinomatosis and Its Impact on Outcome. Am J Clin Oncol. 2010 Oct;33(5):456-60. 47. Chua TC, Marshall JL, Marshall MB, Esquivel J: Multi-Modality Therapy for Metastatic Colorectal Cancer. Letter to the Editor, Am Surg. 2010 Jul;76(7):777-8. 49. Esquivel J and Sugarbaker PH: A “Happy Marriage” Between Open and Closed Techniques of Heated Intraperitoneal Chemotherapy. Cancer Journal 2009 Sep-Oct;15(5):448. 50. Esquivel J: Current Status of Colorectal Cancer with Peritoneal Carcinomatosis. Ann Surg Oncol. 2010 Jul;17(7):1968-9. 51. Chua TC, Liauw W, Koong HN, Esquivel J: Surgical Therapies in Metastatic Colorectal Cancer With a Potential for Cure. Am J Clin Oncol. 2011 Jun;34(3):326-31. 52. Nissan A, Garofalo A, Esquivel J: Cytoreductive Surgery and Hyperthermic Intra-peritoneal Chemotherapy (HIPEC) for Gastric Adenocarcinoma: Why Haven’t We Reached the Promised Land? J Surg Oncol. 2010 Oct. 1;102(5):359-60. 53. Chua T, Morris D, Saxena A, Esquivel J, Liauw W, Doerfer J, Germer C, Kerscher A, Pelz: Influence of Modern Systemic Therapies as Adjunct to Cytoreduction and Perioperative Intraperitoneal Carcinomatosis: a Multicenter study, Ann Surg Oncol. 2011 Jun;18(6): 1560-7. 54. 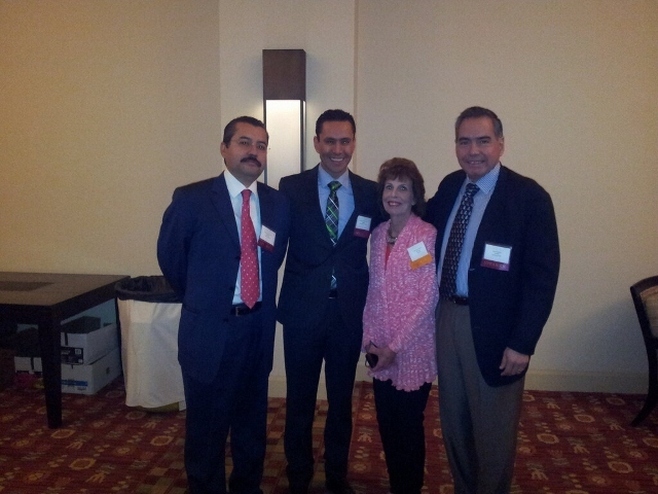 Esquivel J, Stojadinovic A, Levine EA: The American Society of Peritoneal Surface Malignancies(ASPSM), Ann Surg Oncol. 2010 Nov. 11. 55. Pelz JO, Chua TC, Esquivel J, Stojadinovic A, Doerfer J, Morris DL, Maeder U, Germer CT, Kerscher AG: Evaluation of Best Supportive Care and Systemic Chemotherapy as Treatment Stratified according to the retrospective Peritoneal Surface Disease Severity Score (PSDSS) for Peritoneal Carcinomatosis of Colorectal Origin, BMC Cancer 2010 Dec 22; 10:689. 56. Cao C, Yan TD, Morris DL, van der Speeten K, Laurberg S, Glehen O, Link K, Piso P, Tentes AA, Deraco M, Larsen SG, Kecmanovic D, Bayón LG, Melero JT, González-Moreno S, Mahteme H, Gertsch P, Moran B, Esquivel J, Alexander R, Levine EA, Sugarbaker PH: Prospective Registry On Mesothelioma Peritonei Treatment (PROMPT): study of design and rationale. Tumori. 2012 Jan-Feb; 98(1):166-71. doi:10.1700/1053.11517. No abstract available. 57. Brücher BL, Piso P, Verwaal V, Esquivel J, Derraco M, Yonemura Y, González-Moreno S, Pelz J, Königsrainer A, Ströhlein M, Levine EA, Morris D, Bartlett D, Glehen O, Garofalo A, Nissan A.. Peritoneal carcinomatosis: cytoreductive surgery and HIPEC---overview and basics. Cancer Invest. 2012 Mar;30(3):209-24. Review. 58. Esquivel J, Averbach A: Laparoscopic Cytoreductive Surgery and HIPEC in Patients with Limited Pseudomyxoma Peritonei of Appendiceal Origin. Gastroenterol Res Pract.2012;2012:981245. Epub 2012 Apr 11. 60. Gueorguiev A, Mackey R, Kowdley G, Esquivel J, Cunningham C: Minimally invasive evaluation and treatment of colorectal liver metastases. Int J Surg Oncol. 2011;2011:686030.Epub 2011 July 7. 1. Esquivel J and Sugarbaker PH. Cytoreductive Surgery and Intraperitoneal Hyperthermic Chemotherapy: The Surgeon’s Role. Cameron’s Current Surgical Therapy Textbook. Ninth Edition, 2007. 2. Esquivel J and Helm W. Methods of Delivering Intraperitoneal Hyperthermic Chemotherapy: The Open and Closed Techniques. Humana Press, July 2007. 3. Esquivel J. Cytoreductive Surgery for Peritoneal Malignancies-Development of Standards of Care for the Community. Surg Oncol Clin N Am. 2007 Jul;16(3):653-66. Derechos de PMP Pals' Network © 2014. Todos los derechos reservados.